Can a Golf Simulator Take Your Game to the Next Level? Can a Golf Simulator Take Your Game to the Next Level? Home › Golf Talk › Can a Golf Simulator Take Your Game to the Next Level? Can a Golf Simulator Take Your Game to the Next Level? Are you looking to up your golfing game? You might want to look at a golf simulator. These devices can be used to take your golf game to the next level. No matter your level of experience, you might benefit from trying out a golf simulator. Golf simulators make it possible to play in venues and courses that you might never actually visit in person. But, these devices give you opportunities to play golf like you never have before. Can they really benefit your game, though? There are many different gadgets and gimmicks available for golfers today. But, separating what is truly helpful from what is just another fly-by-night fad may be confusing. Where do golf simulators fall along the spectrum? Are these worth your time and money? Will they help you take your game to the next level? Here are a few things that you might consider when deciding if a golf simulator is right for you. Learning how to play golf at the expert level means knowing how foreign climates, wind and weather affect your game. Golf pros have to learn to take winning shots on a variety of landscapes. Most of us cannot afford to visit golf courses all over the world. Not only would these games be expensive, but who has the time to spend galavanting around the continents for an afternoon of golf here and there? One of the things that draw golfers to try a golf simulator is that it allows them to experience golf courses that they might never actually have the opportunity to see in real life. These experiences can make the game more interesting, but can also help players improve their skills. 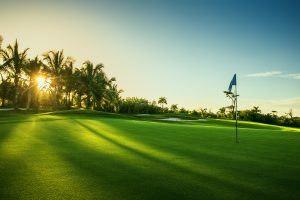 If there is a course that you have always wanted to try, but it is located in the Dominican Republic, for example, a golf simulator make it possible without a major investment of time or money. Those who have had the experience believe that this will encourage year-round practice and draw crowds that might not otherwise play as often. A golf simulator makes it possible to enjoy a day of golfing even when the weather does not agree. In times past, rainy or cold temperatures meant forgoing a game of golf with friends. But, now golfing enthusiasts don’t have to depend on the forecast to play. They can golf from the comfort of indoors, no matter what the weatherman predicts. The benefit of being able to practice indoors means that players have the opportunity to improve even if the sun refuses to shine. For many players, winter weather excludes golfing from their regular activities. However, a golf simulator makes it possible to golf comfortably on frigid days. The golf simulator means that players can enjoy the sport year-round, in a controlled climate environment. Your practice never has to be cut short due to rain clouds or cold weather. When you can practice all year, then when it is time to compete on the green, you are more likely to be prepared. With a golf simulator, you don’t have to make an appointment with a trainer or wait for tee time on the range. You can train like the pros anytime that it’s convenient. You can train by yourself or play with a friend. The benefit of using a golf simulator is the added control of training anytime. You don’t have to worry about squeezing a practice session in when you can make your own practice schedule. What’s more, is even if you are practicing at home, during night hours, it’s just like practicing with your favorite pro golfers on the course when the sun is shining. The golf simulator makes it possible to accommodate the game to meet your level. Whether you want an easy laid back game or choose a more difficult course, the golf simulator allows you to be in control of your game. Not only are you able to decide when and where you brush up on your golf game, you can also choose the course that best suits your skill level. One of the best things about a golf simulator is that it makes the game accessible at a fraction of the cost than the real thing. If you want to try out a new type of equipment before you take it to the course, using it in a simulated experience might be your best bet. The golf simulator allows you to try out different swings and figure out what works best for you before you make a major investment. Indoor golf practice can be had for much less than your typical tee time costs. If you factor in the travel expenses of playing at a golf course, you could spend hundreds or even thousands trying to nab the perfect golf game. Before you make any major investments, try out your equipment using a simulator. That way, when you are ready to play on the green, you will be prepared for the best game possible. There is plenty of training equipment available that can be used indoors or outdoors. Many of the types of training aids can serve as stand-ins for learning the game from a golf pro. Golf is a great game but it can get expensive. A golf simulator can offer the practice, experience, and versatility to make sure you are ready for your best game anytime. In fact, once you experience the golf simulator, it might be harder to pull you away than you thought. Playing golf just got more accessible, more enjoyable and less expensive. With the golf simulator, the game of golf has changed. Now, there are opportunities that were not previously possible. The simulator is likely to bring more people to golf than ever before. Looking forward to acquiring a golf simulator? What feature excites you the most? Share with us in the comments section below!